Are you celebrating Great British Beef Week this year? Kicking off 1st April, this annual event comes as perfect time to not only champion our brilliant beef industry, but also as an ideal opportunity for food businesses everywhere to remind customers about the finest quality of meat they’re serving. Let’s celebrate the nation’s favourite red meat! From a rare blue to a smoky crisp, beef comes in a whole manner of different varieties and tastes, and there’s a flavour profile for every meat-lover… so get with the joint on our meat-tastic offers this month! See all our monthly offers here. Our 100% Roast Beef Flash is a perfect product for all butchers, delicious served with gravy or even coated in a moreish marmalade glaze. Cooked and portioned in joints of 1.5 - 2.5kg, all the hard work has already been done – it’s over to you to finish off your preferred way! At a low price of only £8.99 per KG this month, you could even give out free samples in store to get mouths watering and coming back for more. No - it’s not a steak out! Looking to serve something a bit different to a joint of beef? Lean and ground for convenience, our fresh J. Buckland steak mince has always been very popular! Using seasonal spices and flavours, you can make this super flavourful for your customers, and offer tips and wonderful recipes. There’s an endless list of tasty meals you can cook up with this product - including burgers, meat pie, meatballs, chilli con carne, and spaghetti bolognaise. Only £4.49 per KG this month. For our extremely valued, hard-working and wonderfully humoured butcher customers, rejoice this month with our U.S Classic U.S 4oz Burgers! This is a great value for you and your customers – coming in 48 in a box – and can be cooked from frozen for convenience. These delightful grills will be flying off your shelves! Only £13.99 for a box of 48! Sometimes nothing beats a classic sliced roast beef sandwich. 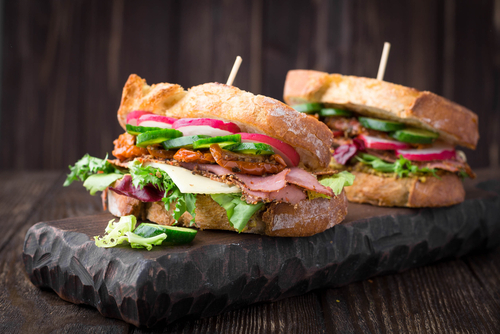 Fresh, flavour-packed and hearty, it’s no surprise that this classic sandwich is so popular! From delis, to school canteens, to cafes and restaurants alike, this is the perfect addition to any lunch-time menu. You can simply serve cold by topping with salad leaves, tomato slices, and onion on fresh bread. Or if you have a toaster, you could even warm this up in a wrap with tasty mozzarella or philly cheese! Available in 500g packs, our sliced roast beef and sliced corn beef are just right for the bill… and the fill! Looking to put together something more exotic than the traditional roast beef sandwich? For a beef sandwich with a tasty twist, we have a specialised team dedicated to dreaming up and creating beef sandwich fillings! All made fresh to order in our own professional on-site kitchen, everything is run in line with HACCP regulations and we provide full traceability of ingredients. Got your own beef sandwich filling idea? Send us a request and we’d be happy to see if we can ‘meat’ your bespoke requirements! Looking for your next wholesale meat delivery for beef success? Fresh from our factory, we offer free next day delivery across the South East and London*, so you can count on tasty meat delivered on time and at a great price. Call one of friendly advisors on 01268 966056 or contact us to make an enquiry. Plus, stay up to date with our Weekly Specials for sandwich fillings, as well as our Monthly Offers on all products, and follow us on Facebook and Twitter to keep updated with all of our latest news. *Note: some products are a pre-order.